Editor’s note: Don’t have time to join a Bible study? Or is one not available at your parish? The Little Rock Scripture Study folks are coming to the rescue. With the permission of the Arkansas Catholic and the Diocese of Little Rock, The Leaven will reprint a 10-part Scripture study series called “Blessed Are You: The Beatitudes.” Gather your friends or just treat yourself. You’ll find the first part here; watch for one installment each month in future issues of The Leaven. This is the first column in a 10-part series. I had never heard that expression before. I had come to the Big Easy to receive in person a theological degree from Loyola University, New Orleans, that I had earned through an extension program in Boise. The thought that my day might be blessed carried special resonance. That was in the year 2000. Having now lived in the South (Little Rock, Arkansas) for nearly 15 years, I have good knowledge of how common blessing a stranger’s day is. I also know if you ask someone, “How are you,” you are not all that unlikely to get, “I’m blessed,” as a response. This is the first of 10 monthly articles from Little Rock Scripture Study concerning the beatitudes, the “blessings” of Christ upon those who would not appear to actually be blessed, such as the poor, the meek and the persecuted. Through the course of these articles, we will follow the beatitudes as they appear in the Gospel of Matthew (5:1-12), in the Sermon on the Mount. In this article, attention is focused on how Matthew’s short introduction to the Sermon on the Mount prepares us to open our hearts and minds to the significance of Christ’s timeless teaching, which he begins with nine blessings. “When he saw the crowds, he went up the mountain, and after he had sat down, his disciples came to him” (Mt 5:1). Matthew has just begun to tell us of Jesus’ ministry following his baptism and temptation. Having called his first disciples, Jesus preaches the good news of the kingdom in synagogues around Galilee and cures everyone brought to him, regardless of what ailed them (4:23-24). Not surprisingly, this attracted a great deal of attention, and soon crowds gathered around him wherever he appeared. Matthew does not tell us exactly where the Sermon on the Mount occurred, choosing instead to simply affirm that “he went up the mountain” to deliver it. The many Jewish Christians who would have first heard Matthew’s recounting of the sermon would be quick to think of Moses on Mount Sinai. Moses, the great prophet and teacher of Israel, was tasked with revealing God to the people of God on “the mountain” (Ex 3:1-2). Centuries later, Jesus, having gone up another mountain, sits down. This was the proper posture of a religious teacher. To this day, universities endow their most honored professors with a “chair.” By Jesus’ time, religious authorities in Israel were said to teach from the chair of Moses (Mt 23:2). As we read Matthew introducing the Sermon on the Mount, we are meant to be aware of just how important, just how authoritative, Jesus’ instruction will be. No one since Moses has ever taught like this before, and Jesus’ teaching will go to the depths of the soul that Moses never reached. Matthew’s introduction to the beatitudes actually comes with a warning: We can position ourselves to listen to Jesus in one of two ways — the way of the crowd, or the way of the disciples. No one who contemplates the beatitudes immediately thinks that he or she has already earned the blessings they offer. Rather, those whom the beatitudes are intended to bless would probably be regarded by the crowds as people who were more likely suffering under a curse than a blessing. And that is why, as we contemplate the beatitudes in forthcoming articles, Matthew’s intentional distinction between the crowd and the disciples should be kept in mind. When I read the beatitudes that follow, I am challenged to note that, if I hear them as one of the crowd, I will be amazed at the loftiness of the ideals they express. But if I am a follower of Jesus, then he expects me to live them. Recall a time when you felt most blessed. What are times or events where you have felt the excitement of being part of a crowd? 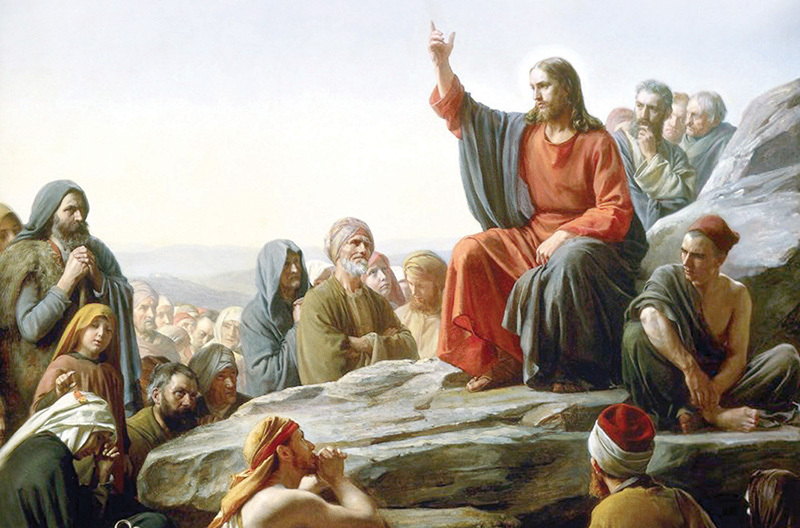 Why does Jesus deliver his most famous sermon from a mountain? Why does he do so from a seated position? What are some ways you think the disciples would listen to Jesus in a way different from how the crowd would have heard him? This article was originally published in Arkansas Catholic Feb. 11, 2017. Copyright Diocese of Little Rock.